This wasn’t Marty Slimak’s first rodeo. The longtime head baseball coach had been to the NCAA Division III College World Series five times before and had helped lead teams to the national championship game twice. None of it had ended well. Slimak was an assistant coach in 1992, and the head coach in 1996, when CLU let late-inning leads slip away in championship games, both times to William Paterson College of New Jersey. Here were the Kingsmen again, at the College World Series in Appleton, Wisconsin, but this year they would pull through to the very end. On May 30, they defeated Washington & Jefferson College (Pennsylvania) in the best-of-three series and earned the program’s first national championship. It is the second Division III title won by a Cal Lutheran team, joining the 2015 women’s volleyball squad. The football team won the NAIA Division II championship in 1971. At 40-11, the baseball team finished at the 40-win level for only the second time in school history. The Kingsmen began slowly with a 3-4 record and Slimak certainly had no thoughts of an NCAA title at that point. “Not in my wildest dreams,” he said. But after an early period of experimenting with different lineups, the Kingsmen won 37 of their last 44, including a three-game sweep in the Southern California Intercollegiate Athletic Conference tournament and four games in the NCAA West Regional at Tyler, Texas. CLU served notice it was the team to beat in the regional, ending its first game against Concordia (Texas) by turning a triple play. The Kingsmen went into the World Series determined not only to win, but to enjoy the experience. Knowing his team, Slimak simply went with it. Fullerton said fishing was the perfect pregame ritual. The Kingsmen started off strong in the World Series, beating Wheaton (Massachusetts) 4-2 and taking 14-5 and 10-8 decisions over North Central (Illinois). That put CLU into the best-of-three championship series against Washington & Jefferson. 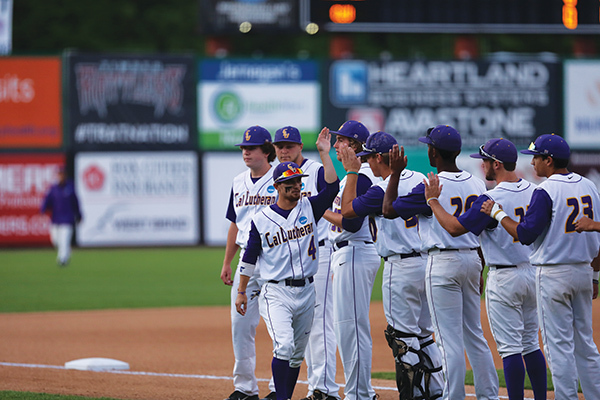 But the second game against North Central went nearly 3½ hours, not ending until 12:35 a.m., and CLU was sluggish in Game 1 on Memorial Day in the series against W&J. Washington & Jefferson’s Presidents took advantage and won 12-2. Suddenly, Slimak was having flashbacks to the missed opportunities of the ’90s. Slimak decided his players needed a pep talk after Game 1 – and his players decided he needed one, too. Attitude, as much as ability, was key for the Kingsmen. CLU came out the next day and won Game 2 by a score of 12-4 with junior right-hander Nate Wehner (10-3) pitching a complete game and striking out eight. The Kingsmen racked up 22 hits against the Presidents, including a 3-for-5 performance by sophomore first baseman Weston Clark with two doubles and three runs batted in, and a 4-for-5 showing by Fullerton. Fullerton had a team-leading .478 batting average (11 for 23) in the College World Series with six runs and six RBIs. The pitching start for Game 3 would be given to a freshman, right-hander Scott Roberts. Roberts (6-1) pitched strong six innings, striking out four and allowing two runs and five hits. When he left with a 3-2 lead, the ball was given to Salud, who was looking to earn a school-record 14th save and his third of the Series. Salud, the SCIAC Newcomer of the Year, is a transfer from Glendale Community College. He was born in the Philippines and played one year of college ball there. in Manila right now. He’s almost like a little [Manny] Pacquiao, man,” said Slimak, comparing him to the Philippines’ famous boxer. Salud has been celebrated by media in the Philippines. No Filipino has ever been drafted by Major League Baseball. Salud pitched the final three innings, striking out three while allowing four hits, two walks and one ninth-inning run. In the meantime, his CLU teammates were making things easier for him, scoring one run in the seventh inning and three more in the eighth. With the Kingsmen leading 7-3 in the ninth and two runners on base, Salud got the last batter to pop out to junior second baseman Max Weinstein and the postgame celebration was on. Salud was named the Series’ Most Outstanding Player with a 1.23 earned run average, nine strikeouts and just one earned run in four appearances and 7⅓ innings. With the title safely in hand, Slimak could rest. Especially gratifying, the coach said, was the support the Kingsmen got from every segment of the campus and from those who made the trip to root them on. It is also clear that this national championship belongs to more than just the 2017 team. Jim Carlisle is a former sports columnist and reporter for the Ventura County Star. He has been the public address announcer for Cal Lutheran football since 2001 and lives in Simi Valley.